17 ï¿½ in x 21 ï¿½ in, unframed; 24 ï¿½ in x 28 ï¿½ in, framed. 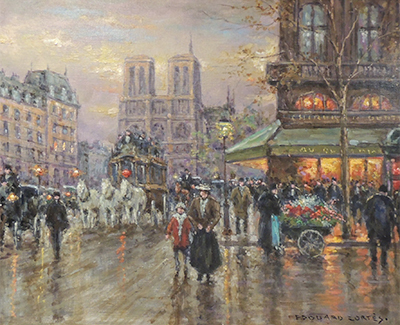 One oil on canvas painting depicting a Parisian street scene. There are horses, carriages and pedestrians in the street. Notre Dame Cathedral can be seen in the background.